Here is a nice and useful software for everyone using Nvidia GPUs for mining crypto coins, especially for people that have built mining rigs based on the very popular for mining GeForce GTX 750 Ti video cards. The tool is called Profit Calculator and in open source, being developed by a user called KBomba. 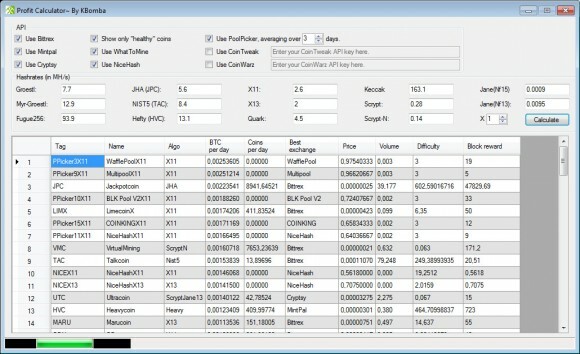 It queries different crypto exchanges such as Bittrex, Mintpal and Cryptsy for coin prices, uses services like WhatToMine, CoinTweak and CoinWarz for the current coin difficulty and block rewards and also checks Nicehash for their current prices as well as PoolPicker for the most profitable pools. The result you get is a list based on profitability that includes not only the most profitable coins to mine, but also the most profitable multipools as well with an estimate on the expected revenue. The hashrate values that are preset in the tool by default are for a single GTX 750 Ti GPU, but you can change them for other cards if you know the hashrate values of your hardware for the different algorithms. This actually makes the tool useable not only for Nvidia, but also for AMD-based mining rigs as well, though you should first check what hashrate will your hardware be able to provide in order to be able to get more accurate results for what your earnings should be. So do give the tool a try, it can be quite useful even if the results may not always be absolutely accurate, you can still get a pretty good idea about the current market and coin profitability.